The developers didn’t, though, and a month or two later an email plopped through my inbox containing a link to a full copy of the game. They hadn’t fixed any of the stuff I complained about, but that was okay because they were fairly minor niggles anyway. However this does mean I essentially got Unity of Command for free, whereas if you decide to buy it you’ll have to shell out $30 for the privilege. Okay, so. Unity of Command is a turn-based “light” wargame set during the Stalingrad campaign of World War 2. I say “light”, but it isn’t really. It’s just a hell of a lot more accessible than its peers; the controls and combat are almost Advance Wars-like in their simplicity, and it doesn’t expect you to individually reload every MP-40 carried by your soldiers with 9mm parabellum. It just expects you to keep them in supply. Supply is generated by nodes at the map edge and travels along roads, with diminishing effects once you leave the road until it disappears entirely. 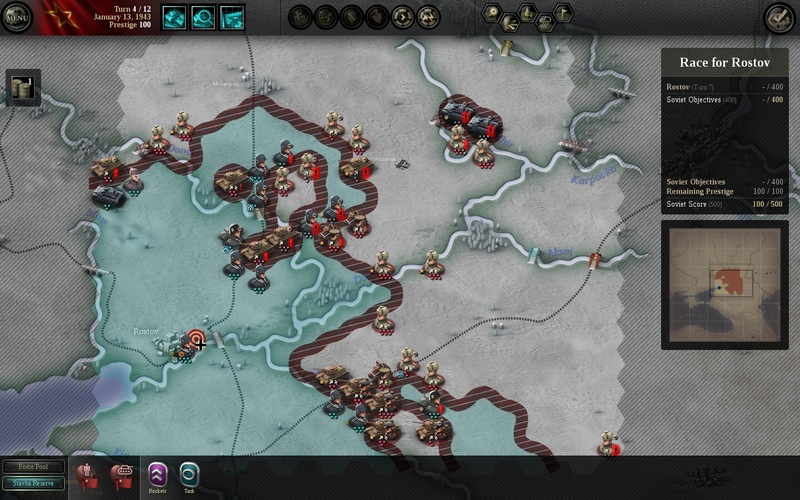 Much of your time spent playing Unity of Command will be spent pondering the problem of supply, but we’ll get to that later. First, I have to talk about what you actually do to play the game. Tanks are therefore precious resources which you cannot afford to waste; it is they who will provide you with the critical breakthrough you need since they have a large movement range and an Overrun ability that sometimes allows them to attack twice. Infantry exists to hold the line and to mop up after the tanks; it can be effective against suppressed enemies (when you attack a unit, you might kill some of it but it’s more likely you’ll suppress some of its strength making it combat ineffective, and suppressed units are very, very vulnerable) but the infantry’s main job is to stop the enemy from doing to you what you’re trying to do to them: punch through, sweep around and cut the other side off from their supply lines. The supply mechanic in UoC is also simple in its own way. As mentioned supply travels along roads and drops off the further away you get from them. A unit which is out of supply for one turn can still fight normally. A unit which is out of supply for two turns cannot attack, but it can still defend. And a unit which is out of supply for three turns will fall over in a stiff breeze. The strict time limits attached to the scenarios do not give you enough time to defeat the enemy in head to head combat; instead, you have to cut them off from their supply and wait for them to wither on the vine en masse. This makes roads incredibly important, both as targets and as weak points that you have to defend from UoC’s sneaky, sneaky AI. Given the number of times I’ve railed against unforgiving robot opponents which seem to take great joy in kicking the human player in the nads, it’s kind of ironic how impressed I am with UoC’s AI. Because it fits that description to a T, it really does. It is utterly brutal and totally without mercy; it will stop at nothing to find the single chink in your carefully conceived plan and before you know it you’re watching helplessly as two thirds of your army collapses in utter ruin for lack of supply. Since UoC is a relatively simple game with fixed troop deployments and supply sources for each scenario this is possibly less of an achievement than a good AI for, say, a Total War game, but the fact still remains that UoC’s AI knows how to play the game better than you ever will. I lost count of the number of times it found some ridiculously convoluted combination of air attacks, partisan uprisings and sweeping cavalry maneuvers to rout my blocking infantry and cut off my tank spearhead, dooming my offensive to failure. 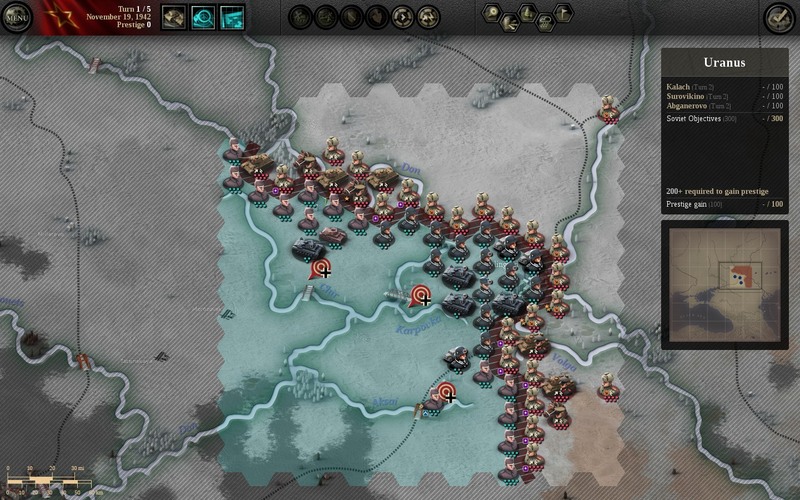 There’s a small amount of asymmetry in the two sides – the Soviets have more men per unit but they’re less good, whereas the German units are higher quality but fewer in number – but it shakes out as being roughly even. The only advantage I actually had over the AI was that I knew it must be possible to win the scenario somehow. That’s another advantage of the static setups; UoC puts me more in mind of a war-themed puzzle game than it does a true wargame since in theory a set of moves must exist which will lead to victory, much like a newspaper chess problem. Unfortunately, in practice, whether your offensive succeeds or not will be at least partly down to a random number generator. Like the last couple of Civ games, UoC will tell you the expected outcome of a combat between two units. That isn’t necessarily what will happen, though. Sometimes you’ll do better. Sometimes you’ll do worse. Sometimes you’ll get an overrun. Sometimes you won’t. Usually the dozens of units that clash on most of UoC’s virtual battlefield ensures that this element of random chance more-or-less averages out over the course of a scenario, and so it doesn’t completely sabotage what would otherwise be an outstanding strategy experience. Sadly there’s one or two scenarios that only give you a handful of units, and it was the experience of playing these scenarios that convinced me the RNG was a bad idea. After the twentieth restart I knew what I had to do. There was one road, two objectives and I had four tank units, so there wasn’t a huge amount of room for improvisation. I just wasn’t getting the combat results I needed, becoming bogged down on the road time and again. Then on the twenty-first try I suddenly got a couple of overrun results and finished the scenario with the maximum possible rating. I hadn’t done anything different, it was just that the RNG had finally decided to stop screwing me over. My other reservation about the game is that it has next to no replayability. Once you have figured out the solution to a level you’re probably not going to go back and play it again. The developers say you’re supposed to try different solutions, but I’d become so wary of being brutalised by the AI that I wasn’t about to put myself through another dozen failures just so that I could find a slightly different strategy that worked. There’s about fifteen scenarios stitched into a couple of campaigns, but they’re honestly pretty linear and you’re better off just picking and choosing which scenarios you want to play. If I had to sum UoC up in one sentence, it would be “Panzer General crossed with chess”. 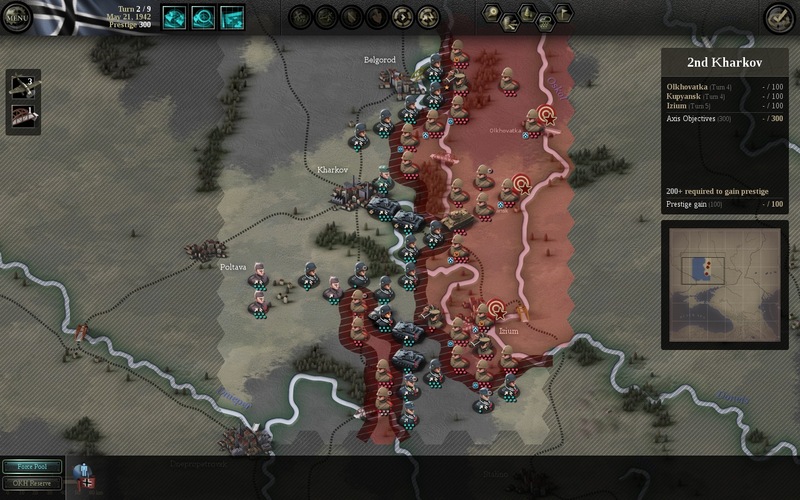 The supply mechanic does a lot for it, ensuring that each scenario plays out like a classic battle of envelopment rather than a knock-down battle of attrition. You maneuver for position, not for kills. 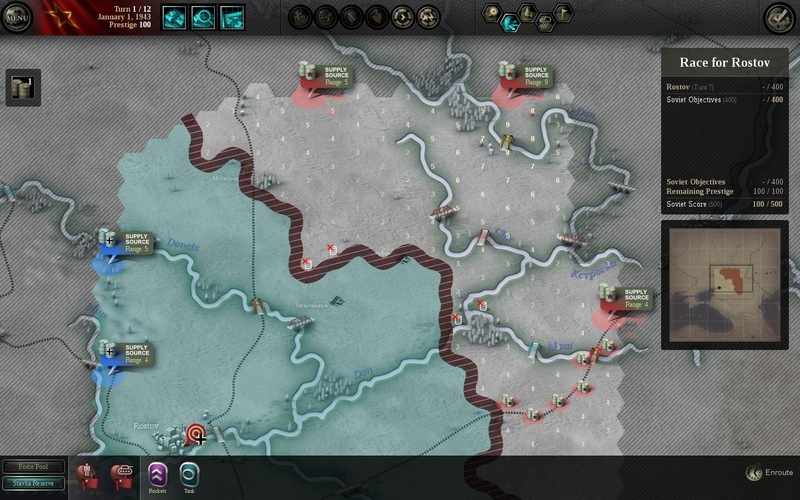 That along with the AI ensures Unity of Command is a cut above the usual trash hex-based wargame — but while you’ll have a good time bulldozing through the scenarios, by the time you’re done you may be left with the feeling that what you got for your $30 genuinely is a little light, and not in a good way. Happily I don’t have that problem, so I have no qualms about calling Unity of Command a Good Game.